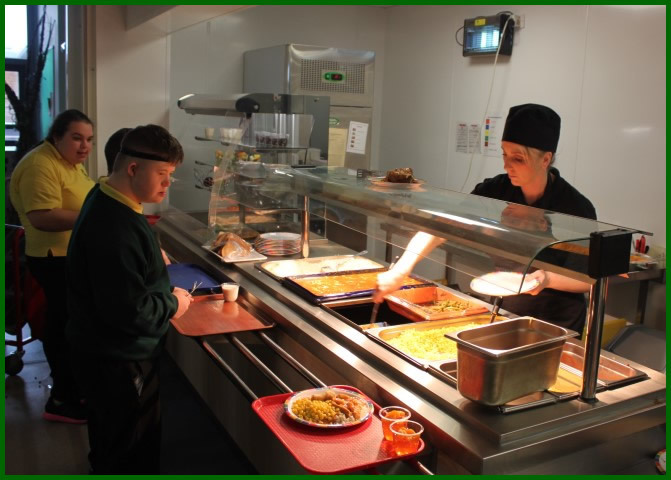 Hot meals are available and cooked fresh on the school premises. Any pupil requiring specialised diets can be catered for. Healthy eating options are positively encouraged. Every member of Absolute Catering are trained on allergens with refreshers each year and all information is held in the H & S folder that is kept in the school kitchen. Where there is a child or young person with a known allergy school obtain information from parents/carers and provide this to the Catering Provider. This is then held in a file with pictures of the child or young person. Each day prior to service an allergen brief takes place with the kitchen team from the cook who goes through each dish and highlights any of the known allergens and also the children or young person with any allergies to any of the ingredients in the dish on that day.